The aim of the present study is to investigate the effect of low-permeability concrete, made with reduced watert-to-binder ratios (w/b) and/or supplementary cementitious materials (SCMs), on the need for air entrainment to achieve freezing-thawing (F-T) durability. In the present study, concrete mixes were made with different types of cement (Types I and IP), with or without fly ash replacement (15%), with different water-to-binder ratios (w/b =0.25, 0.35, 0.45 and 0.55), and with or without air entraining agent (AEA). 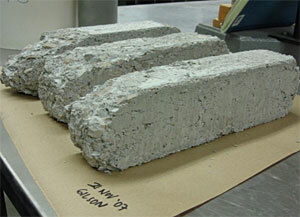 All concrete mixtures were controlled to have a similar slump by using different dosages of superplasticizer. The rapid chloride permeability and F-T durability of the concrete samples were determined according to ASTM C1202 and ASTM C666A, respectively. The air void structure of the concrete was studied using the Air Void Analyzer, RapidAir, and porosity tests (ASTM C642). In addition, the general concrete properties, such as slump, air content, unit weight, and 28-day compressive strength, were evaluated. The results indicate that all concrete mixes with proper air entrainment (ASTM C231 air content ≥ 6%) showed good F-T resistance (durability factor ≥85%). All concrete mixes without AEA showed poor F-T resistance (durability factor < 40%), except for one mix that had very low permeability and high strength. This was the concrete made with Type IP cement and with a w/b of 0.25, which had a permeability of 520 coulombs and a compressive strength of 12,760 psi (88 MPa). There were clear relationships between the F-T durability and hardened concrete properties of non-air entrained concrete. However, such relationships did not exist in concrete with AEA. For concrete with AEA, good F-T durability was associated with an air void spacing factor ≤ 0.28 mm (by AVA) or ≤ 0.22 mm (by RapidAir).